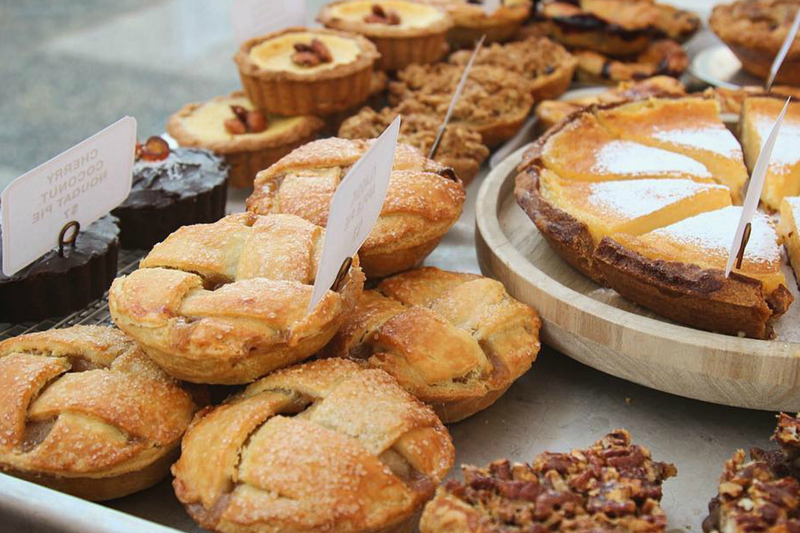 Freshly roasted coffee, sweet-scented baked goods and stalls teeming with produce. Oh how we love a food market! And thanks to our year round lovely weather, Brisbane has some of the best markets on offer, from the suburbs to the city, open day or night! So whether you’re a foodie fiend, locavore or vegan vagabond, you’re sure to love these favourites. Grab your hemp tote, it’s time to shop. Open every Sunday underneath the leafy canopy outside of Milton’s Royal Thai Orchid restaurant, the stalls at this fan-favourite market are just as green as its surroundings. We’re talking organic vibrant blush-red tomatoes, succulent purple beetroots, and lush flowering greens! You’re sure to come for the produce, and then stay for the rest! Food stalls, coffee, live music, arts to clothing… fresh seafood.. Every Sunday, 6am – 12pm, Cribb Street. For a farmers market you can catch the ferry to, head to the Powerhouse on Saturdays for an epic selection of produce, small goods and flowers. Once you’re done shopping, grab a coffee and a croissant (and dumplings and pizza) from the many food vendors to enjoy alongside the riverside views in nearby New Farm Park. Every Saturday, 6am-12pm. Live music and good food – can you name a better combo?! Popping up in different locations around Logan every month, the delectable ever-changing food trucks (although Doughnut Time seems to always make an appearance!) and live performances from local artists makes this night-time market the perfect place to browse just outside of Brissie. Last Friday of every month, 5-9pm. As eclectic as the people who live there, the West End Markets are truly a place for the people! Produce? Artisan meats? Crafts? Flowers? Buskers? Organic Ice tea!? Seriously, whatever you’re after, West End’s weekend market can provide. Every Saturday, 6am-2pm. Work in the CBD? Clear your lunch break on Wednesdays for the Brisbane City Markets, located by Treasury Brisbane at the end of Queen St Mall. Think bagels, pasta, smoked meats and international cuisine, alongside produce and small goods. Our tip? Return at the end of the day for the best fruit and veg at dirt cheap prices. Want 4 mangoes for $5? This is the place to find it. Every Wednesday, 8am – 6pm. For those who’s alarm clock never sees an AM on a Saturday, here’s a market you’ll be able to make it to. Mount Gravatt Marketta is known for its super vibey atmosphere, western street food and mesmerising mimosas (and all your other favourite cocktails!). Good food with good tunes ensures goers a guaranteed great night out! Every Saturday, 4pm-9pm. There’s also a Sunday Farmer’s Market weekly from 6am-12pm. For a market that’s super comfy and easy to get to, be sure to choo choo choose the Woodridge Train Station Markets. As well as housing all the usual amazing fresh fruit and vegetable stalls, this Sunday markets also sports a wide array of South Asian street food stalls, thanks to the suburb’s diverse community! So, dust off your shopping bags and race down to the markets – we’ll see you there! Eat vegan? Yes we can! Lovechild Market Place has opened!